Open Revolution: Are you a crisis junkie? Are you a crisis junkie? If things are comfortable, our motivations for action make it tough to change even when the alternative could be so much better. Small problems flare up into big problems, and we find ourselves bouncing from one crisis to the next. Imagine if you're sitting in a conference room with a bunch of other people, and the speaker says the other room has better lighting, better acoustics, and $100 bills on the chairs. Some eager people might move, but most would stay behind, comfortable with their spots and the upcoming lecture. If on the other hand, someone at the back were to call your attention to the room being on fire, the room would clear out instantly. Most of us are not motivated by the pursuit of pleasure as much as we are by the avoidance of pain. This is why it's so easy to get stuck in ruts and putting out fires. As individuals and as a society, we are reluctant to deal with big problems until they become a crisis. We're great at dealing with heart attacks, but we're terrible at dealing with cancers. Take the financial bailout in the U.S. for example. It was fairly straightforward for them to commit mindbogglingly large amounts of money to prop up the economy because of the financial crisis. On the other hand, they've had a predictable and growing problem with social security for years, but they won't solve it. Solving it would involve reducing senior citizen's benefits which is politically unpalatable, but fiscally necessary. Slow growing major problem? Kick it down the road. It's easy not to do anything, and it takes a lot of pain to get most of us over the hump towards action even when the benefits of taking action are clear. Diet and exercise come to mind. We know they're good for us, but are we doing all we should? Elections favour the incumbent. Businesses favour business as usual, and often convince you to favour it too. The companies selling you gasoline don't have much incentive to sell you bicycles or electric cars. There are major costs to failing to address our energy and climate problems, and major benefits to society, the environment and even the economy if we can get moving and make the changes we need in time. Don't get caught thinking you can kick the problems down the road. That just makes them worse and harder to solve. 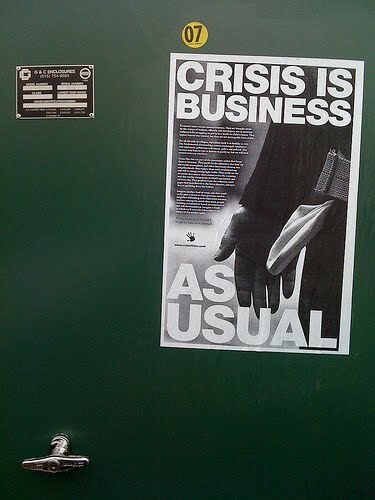 Don't be a crisis junkie. Crisis of Culture: Scrutinizing culturally sacred cows. Money Trouble: Where does money come from? How interest on debt threatens the environment: Makes us keep exploiting the planet to get out of debt. How rich is your heritage? Creative task? Rewards lead to worse results.